If a picture is worth a thousand words, than surely a taste is worth a million. 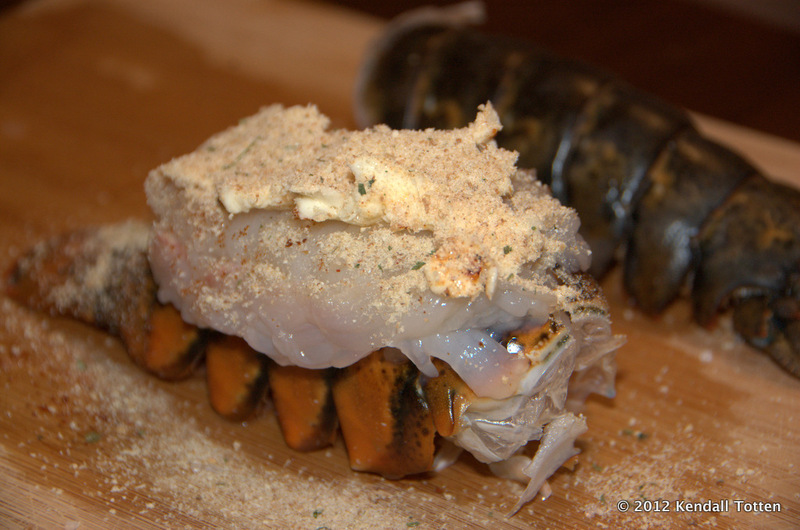 I didn’t grow up on lobster tail so I really didn’t know what to expect from this dish. 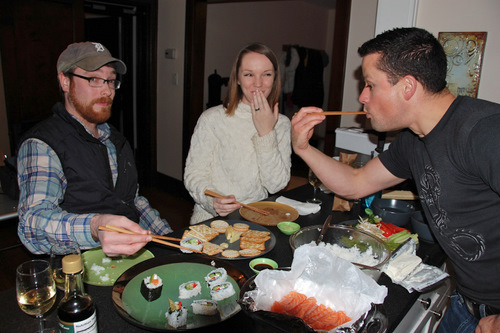 It started because Fresh Market was having a sale on lobster tails for only $6 a piece. Above: warm butter blended by hand with a fork, sea salt, paprika, bread crumbs, & fresh pepper. (Trust me, it’s fresh, even if I didn’t grow up on a pepper farm). 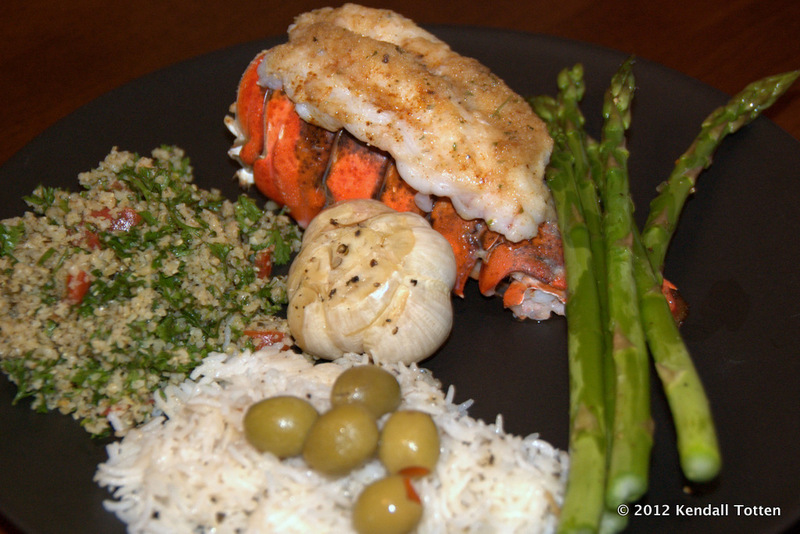 The recipe is really simple because most of the wow factor comes from the sheer fact that you are about to eat lobster. When we picked up the lobster tails, they were frozen. Let them thaw slowly in cold water over several hours. Don’t rush it or you break the cells down further and ruin the taste. Cut down the top of the tail, then grab it lengthwise and squeeze towards the bottom to open the shell further. This makes it easy to pull out the meat that’s inside. At first I had just reached in with my fingers and tried to pry it out the meat; and while that did work, it turned out to be much more difficult. 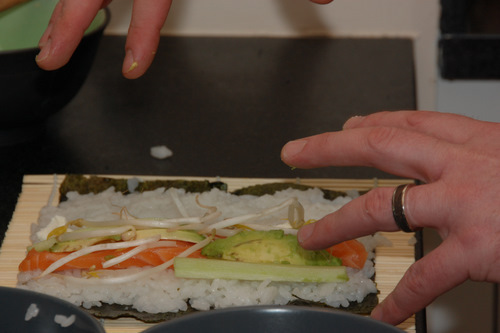 By making a slit down the center, you can then fan out the meat and spread it over the top of the shell. This gives you a nice platform to add the butter, paprika and breadcrumbs. The recipe I was following called for several tablespoons of softened butter. So I added a lot of butter… too much really. 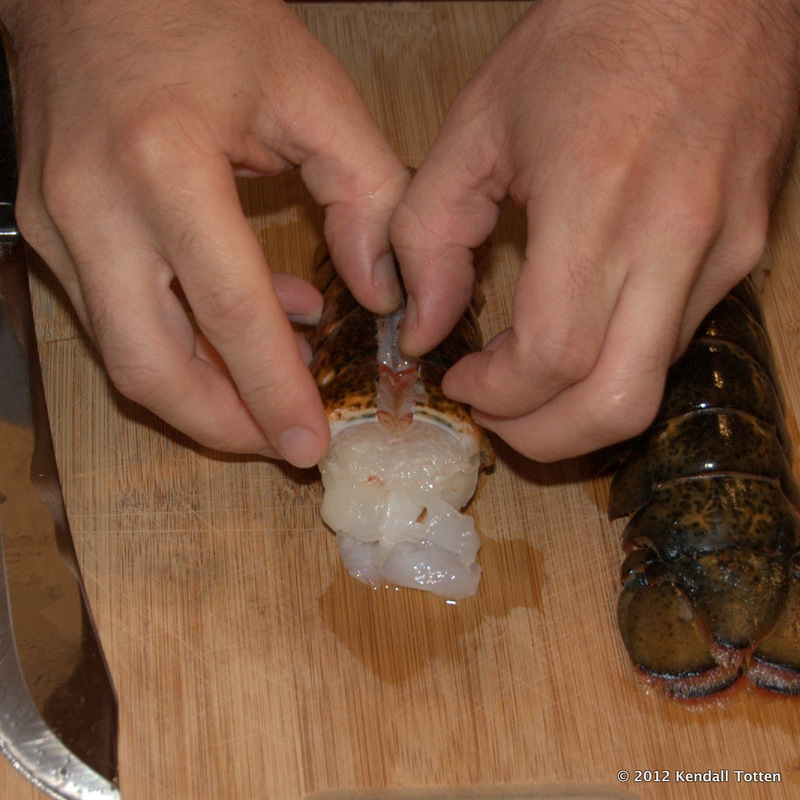 Lobster has such a sweet delicate taste of its own, that the gobs of butter almost masked the lobster altogether. Lesson learned, next time I’m going to only use minimal butter and let the lobster speak for itself. Once the tails are prepped, pop them into the pre-heated over at 350 degrees for about 18-20 mins. The final color should not have anything translucent, it should all be a solid white. Roasted garlic is a great ingredient to many recipes, but it can also double as a tasty side dish. Pull off as much of the dry garlic skin as possible, cut the top flat and sprinkle with olive oil and pepper, maybe a dash of salt. 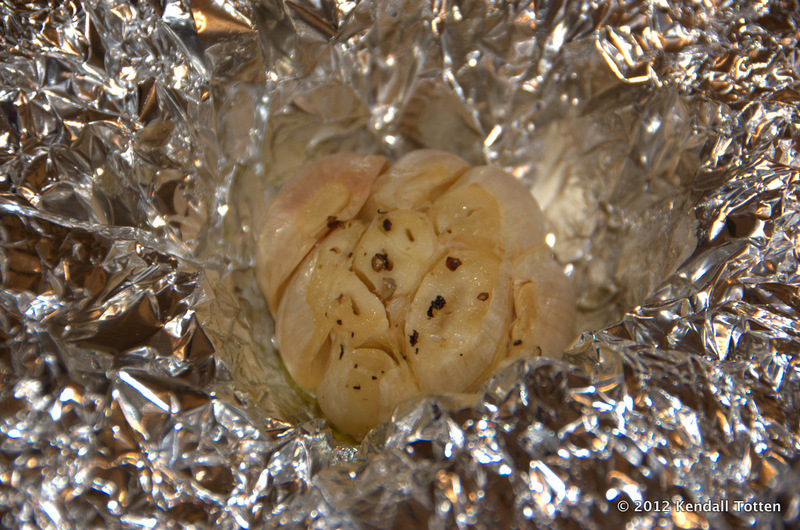 Then wrap them in tin foil, and place in oven for 20 minutes. Delicious! 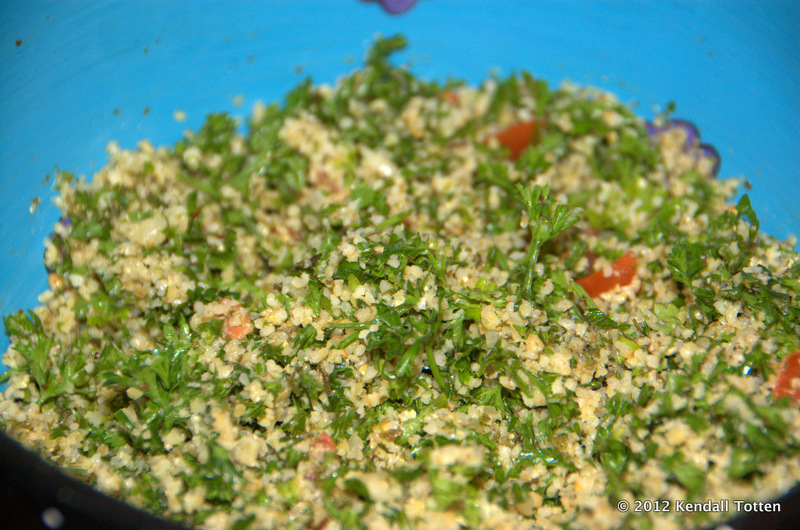 Kendall made some fresh tabouli salad for a side. You can buy a pre-made tabouli salad mix that calls for only olive oil and water, but we recommend also adding your own fresh parsley, tomato, and lemon juice. 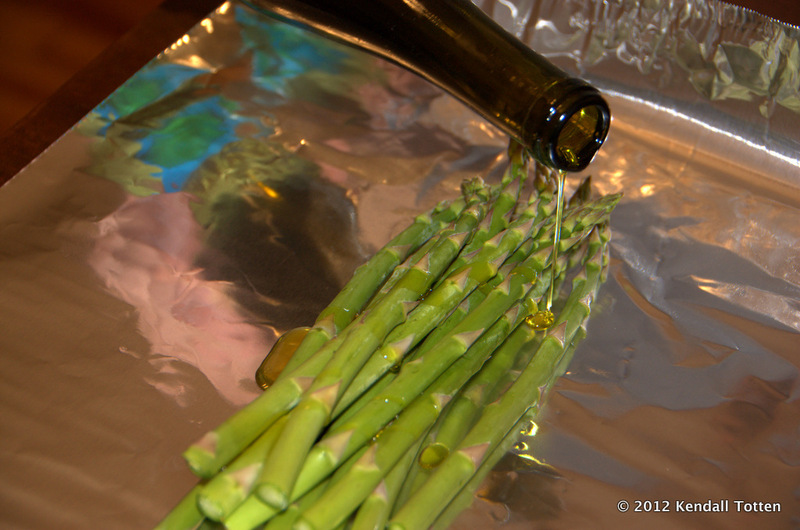 Next we roasted some asparagus with salt, pepper and Fustini’s Sage & Wild Mushrooms Olive Oil. Take care not to over-cook it, as it’s always better with a little crunch. 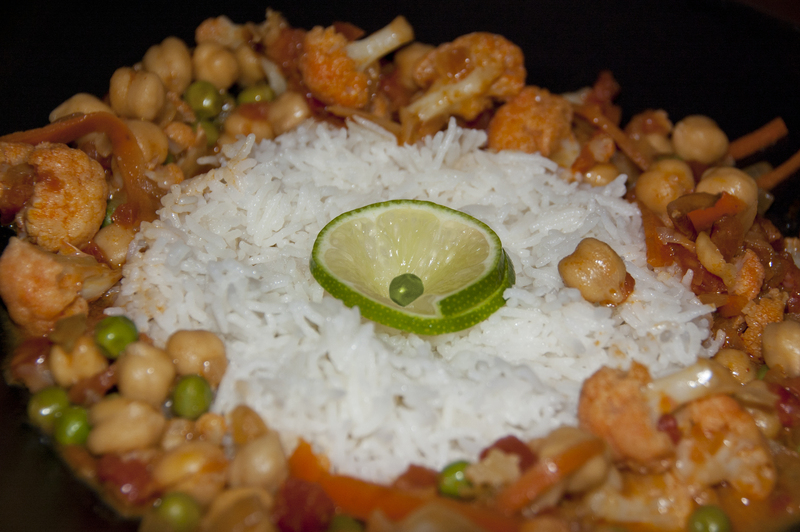 And finally we threw in some rice with italian herbs, olive oil and green olives on top. 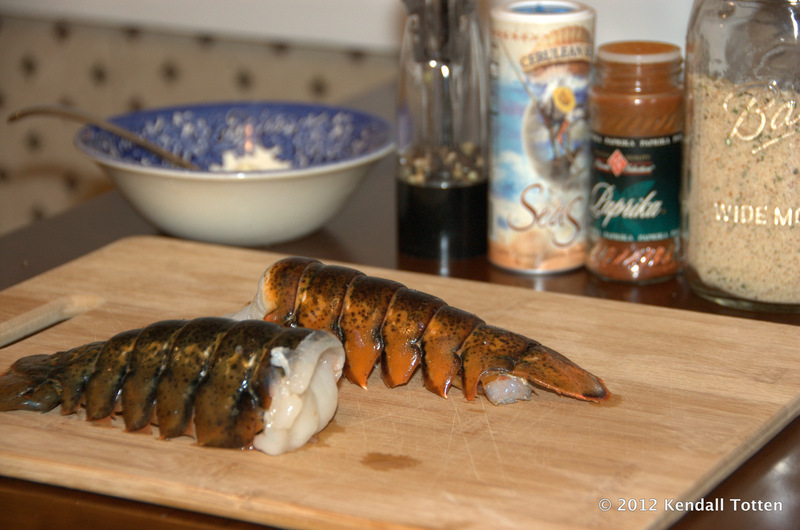 Lobster tail tastes like a million bucks, but isn’t too difficult to prepare at home. 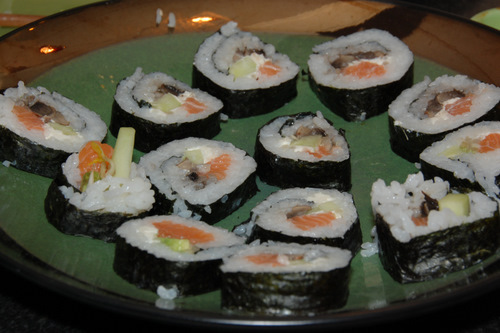 This dish was fun to make, easy and well worth it! 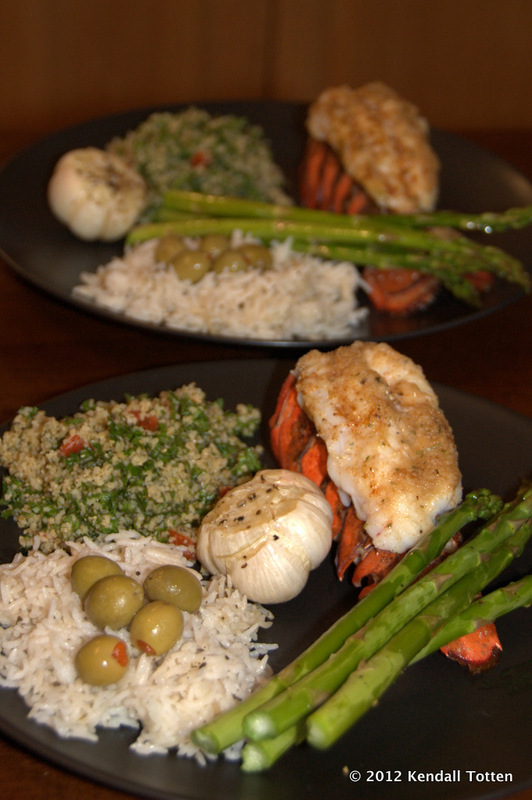 I have to say that this was one of my favorite dishes that we have made so far. It will definitely make the cut and will be something that we use to entertain guests with in the future!